A recent commercial featuring Padma Lakshmi, shows the shapely, sultry host of Bravo's Top Chef, immersing herself in a Hardee's Western Bacon Thickburger –- of all things. "After traveling the world and writing two cookbooks, I think I've tasted every flavor imaginable...but there's something about the Western bacon," she moans, before lifting up her skirt over her gaping thighs, and licking the Thickburger sauce from her legs and fingers. "More than just a piece of meat," a male voice over finally booms. In any event...I'd have to agree with all those who say : "Wow, she sure looks like one." And I'm sure that extra splash of ketchup on her finely waxed leg would probably bear that out. Nevertheless, T & A sells, I guess. No matter how you slice the tomato. Environmentalists everywhere have been hailing Michelle Obama for her "digging" efforts on the South Lawn of the White House this past week. The first vegetable garden since Eleanor Roosevelt’s victory garden during World War II, will soon be sowed and lots of fresh, nutritious veggies will be springing forth. Like several of his predecessors, our sitting president has his definite likes – and dislikes – and beets have been firmly planted into his "hate 'em" column. Even though, arugula and lots of butternut squash -- are said to be making the cut. In any case, a big "kudos for freshness" goes out to the Obama Administration for this past week's "groundbreaking." The multi-gold-medal winner got into hot water after a photograph surfaced showing him communing with a bong at a South Carolina fraternity party. 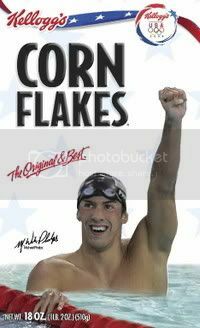 That prompted Kellogg's to say it would not renew Phelps' endorsement deal. Then two weeks ago, the Food Bank suddenly received two tons worth of Corn Flakes and Frosted Flakes in boxes featuring Phelps' toothy grin. And for so many struggling Americans resorting to feeding their families from food pantries these days, clearly, it's the breakfast flakes inside that count -- and not whose picture is on the box. Therefore, I say a big, "Kudos" to Kellogg's for this effort. Well, as you already know it's March, and over at the Epicurious food blog, Ireland's foremost TV chef and cooking authority, Darina Allen, shares her tips for making a favorite St. Patrick's Day recipe. "Americans still think we live on corned beef and cabbage over here," says Allen, who is an Irish cookbook author, and a teacher. In fact, the dish that's synonymous with St. Patrick's Day and all things Irish in the U.S. is so rarely eaten in Ireland -- for the holiday or otherwise -- that some people wonder if it's actually Irish. In Irish Country Cooking, Malachi McCormick says he likes corned beef, but then adds: "But our national dish? No, it's a New World dish!" Furthermore, thanks to the many awful versions served in bars in the U.S. (and washed down with plastic cups of green beer) this one-pot meal is often reviled by Irish Americans (and Irish-for-a-Day Americans) or, at the very least, relegated to a sloshy once-a-year tradition. In any case, read more here. And, as one who has visited Ireland on several occasions, um...yeah, Malachi's right. So please, spare me on the green beer thing, okay?